Going for a run is the best thing for my mood! SAM-e is a naturally-occurring compound that works with the body's chemistry to maintain a more balanced mood. As you get older, your SAM-e levels can diminish, causing changes in your mood and temperament. 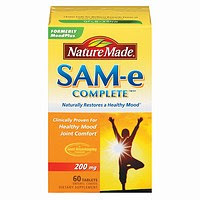 Nature Made SAM-e Complete is a daily supplement that replenishes your body's natural levels of SAM-e to help naturally restore a healthy mood in as little as 7 to 14 days. Nature Made SAM-e Complete recently launched Give a Smile to help Dream Factory, the second largest children’s wish-granting organization in the U.S., to grant the wishes of three children suffering from a critical or chronic illness. You can help Adam, Andrew and Shay's wishes come true simply by uploading a picture, commenting on Facebook or tweeting a message. To enter and win a three month supply of Nature Made SAM-e Complete along with a Nature Made aluminum water bottle and mood journal, please comment on this post with your favorite mood-lifter. Now following you on Twitter as hybroanglid. Just subscribed to RSS via Google Reader! Whoo-hoo! My favorite mood-lifter is chocolate :) *Thanks* for the giveaway! I find good music to be the best mood lifter for me. Something peppy (usually 80's) will perk me up in no time. It's even better if it's loud and I'm driving in my car! The best mood lifter for me is getting outside and walking.